My first outfit of the new year, an appropriately layered up one, as temps were in the 20's. Dressing for the cold is probably my least favorite thing to do. My pants never seem to be the right length, my search for cute boots is unending (though I may unfortunately be stuck with a pair I bought at Nine West in NYC because to my surprise, there are no Nine West retail stores in CT) and even when I have my gloves on, I still lose all the feeling in my middle and index fingers. Even though it goes against my sense of style, I tried on these Ugg gloves and they were really warm and I wonder if they might be worth the $160 investment if it means keeping my hands safe from the cold this winter. Or maybe this, slightly less expensive and more fashionable pair would work? All I can say is that these new J.Crew factory gloves, while only $16, are not doing the job. Yep, dressing for cold isn't very fun, but we gotta do it!! I know. Yuck. Now that the holidays are over--I'm over the snow (that we got on Christmas Day). 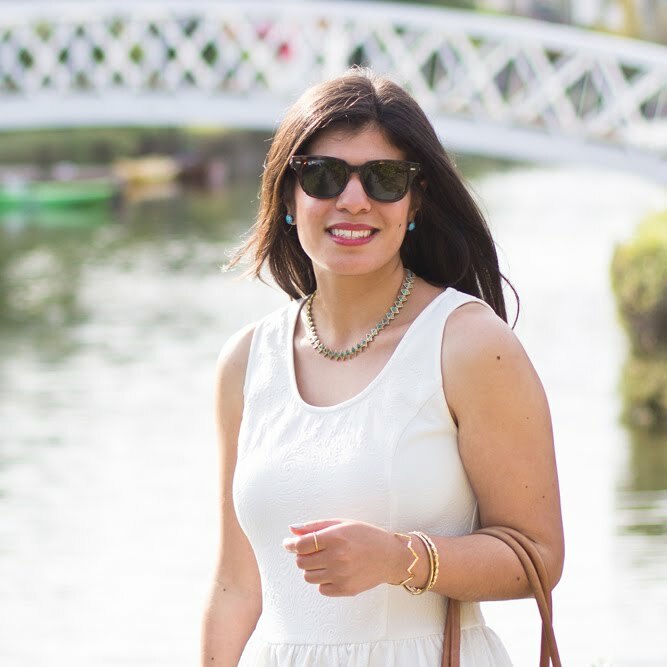 It has been bitter cold and I am dreaming of summery outfits (or even spring ones!). Love the coat and sneakers Lydia! Happy New Year! Well you look cute at least, that's something. But yes, ugh to dressing for cold winter. My fingers always lose feeling too, but I think it's because I always buy cheap gloves. It's just not something I want to spend money on, you know? You should switch to mittens!!! Especially if you can find some wool ones. I'm a bank teller by day and it makes my hands sore around the joints sometimes if I have to count a lot of money, especially if they're cold. My grandmother gave me a pair of wool mittens she made from an old sweater and I'm never switching back to gloves!!! When it comes to winter dressing, the struggle is real. It's not even that cold in Vancouver by comparison to most place, but once you get cold, it's so damp and humid that getting warm again can be a 2-3 hour process. So I feel your pain. I have to admit, when I lived in a colder city, Ugg boots, though pricey, actually made a world of difference - as did their cheaper counterpart, Emu. Maybe they make gloves? If so, I'd say they're worth the investment. And as for Nine West Boots, what a shame there's nowhere to return them! I bought a pair of ankle boots from them this fall that have proven to be the worst quality shoes I've ever owned, including pieces from H&M. Might be worth of drive back to NY to get your money back! I love your coat and the whole look is fabulous! I know what you mean about dressing for the cold.. I get so excited for chilly weather in the fall so I can wear boots and scarves but I'm so over it by January! just love the layering, dear! cute sweater :) Happy New Year! Love it! I need to pull out my vintage coat with the animal print. At least you have that amazing coat to strut around in! Fabulous layering! Sorry it's so cold, but at least you look great! 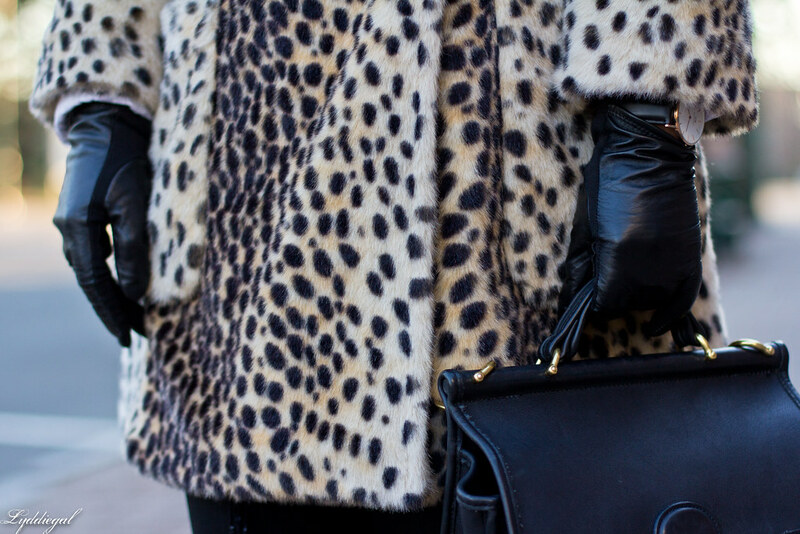 I'm always jealous when I see a leopard coat...they always look so chic! Great layering. Love this look so much and aren't these shoes the best! Your coat is beautiful! I've only tried the Ugg gloves on at the store, but they feel so warm. I just wish they weren't so expensive! I think you're doing pretty great as far as cold weather wear goes. I always feel like dressing for extreme cold is like dressing for extreme heat-- the outfits get simpler as the temperature rises/plummets. I agree about the gloves thing, which is why I just got some lined with Thinsulate. They almost work too well because my hands get sweaty if the temperature's above 25! Yeah sometimes function trumps fashion when it comes to the super cold, but you are still looking great here! I think you do layering well and look amazing while doing it. Your leopard coat is fabulous. I really need a pair of warm gloves. It's hard to find a pair that is cute while still keeping you warm. That pair from Uggs look so cute! Love the layering here! I love the coat! You look really cute! love that coat, so chic! that leopard coat is so chic! UGH, I feel your pain. Cold hands are the WORST, especially when you're wearing gloves as it is. I find the combination of gloves and my hands in my pockets tends to be the only solution I've found. Usually when it's that cold, I'm hunched over with my hood pulled over my head, so it's not like I need my hands. Oh, the joys of winter. But hey - your coat is stunning!! To stay stylish in cold is such a big challenge. We get cold and humid winters here in Ireland. It feels like no matter what you wear cold goes through. As much as layering can be fun yet in winter I get so tired from it. It feels like carrying big bulk of close. I'm so looking forward Spring. 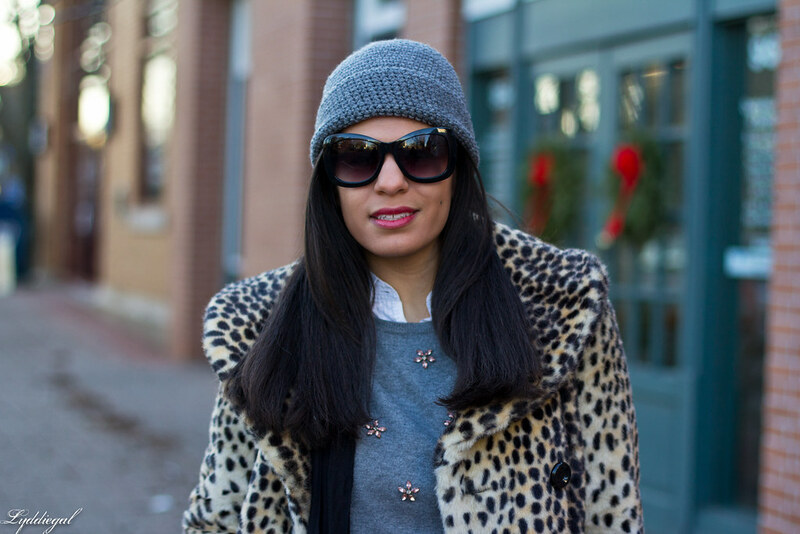 You look gorgeous in your cozy leopard coat paired with neutrals. I love that your jumper is sparkly it ads such a fab romantic touch. Such a shame with boots. I had problem with Topshop boots. Worst quality and worst customer service. Never will go back to buy something. Can we talk about how cute you look in hats? Love this! I can't give you any cold weather advice unfortunately, it doesn't even get cold enough to need gloves here in Queensland. But I'd assume gloves, like all winter wear, will go on sale out of season...so that would be a good time to pick up a pair! Won't help you this winter though, but maybe next winter? haha! Seriously obsessing over that amazing coat! Love how you added the sparkle with the sweater! You look fabulous! Cheers to the new year! Wow!!! lovely this coat and so great your look. can we talk about this coat? FABULOUS! That coat definitely looks WARM and FABULOUS on you! Girl, I am there with you about the cold though. I HATE dressing for cold weather as I am always afraid that I will still be uncomfortable. Thankfully, I am in San Diego now, so the cold spells are few and far in between. I absolutely hate being cold and I'm reminded of that every time I'm back in PA for the winter. Those Ugg gloves look warm but that is super expensive for a pair of gloves! haha... Plus, I'm always taking gloves on and off and I'd be afraid I'd lose them. I'm thinking about getting a pair of mittens for next year. I feel like those keep you warmer then gloves...although maybe not as practical since you can't use your fingers!